Disgust is an emotion that is typically associated with things that are perceived as unclean, inedible, or infectious. In The Expression of the Emotions in Man and Animals, Charles Darwin wrote that disgust refers to something revolting. Primarily in relation to the sense of taste, as actually perceived or vividly imagined; and secondarily to anything which causes a similar feeling, through the sense of smell, touch, and even of eyesight. 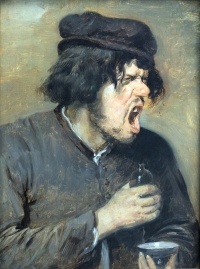 Disgust is one of the basic emotions of Robert Plutchik's theory of emotions. Disgust is thought to have its origins in (and in some cases to be identical to) instinctive reactions that evolved as part of natural selection for behavior which tended to prevent food poisoning, or exposure to danger or infection. Disgust is frequently associated with waste products such as feces or urine, secretions from the human body (such as mucus), and with decomposing flesh, and insects associated with it. As in other human instinctual drives, disgust has an instinctual and a socially constructed aspect. Religious concepts of purity and pollution underlie various systems of taboo food and drink, such as the Jewish rules of kashrut and the Islamic distinction between halal and haram foods. Mary Douglas's 1966 book Purity and Danger attempted to ascribe these rules not to health or ecological reasons as some had hypothesized before, but rather to attempts to maintain symbolic boundaries: the forbidden and unkosher animals were not eaten because their place in the natural order was felt to be ambiguous, "neither fish nor fowl". Believers in food taboos feel that they may be contaminated by exposure to forbidden foods, regardless of their consumption by others or standards of preparation, and can manifest all of the physical and emotional symptoms of disgust at their presence. A recent study found that women and children were more sensitive to disgust than men. Researchers attempted to explain this finding in evolutionary terms. While some find wisdom in adhering to one's feelings of disgust, some scientists have asserted that "reactions of disgust are often built upon prejudices that should be challenged and rebutted." Many patients suffering from Huntington's disease, a genetically transmitted progressive neurodegenerative disease, are unable to recognize expressions of disgust in others and also don't show reactions of disgust to foul odors or tastes. The inability to recognize disgust in others appears in carriers of the Huntington gene already before the disease has broken out. The Anatomy of Disgust (1997) by William Ian Miller. Unless indicated otherwise, the text in this article is either based on Wikipedia article "Disgust" or another language Wikipedia page thereof used under the terms of the GNU Free Documentation License; or on original research by Jahsonic and friends. See Art and Popular Culture's copyright notice. This page was last modified 10:32, 4 April 2018.